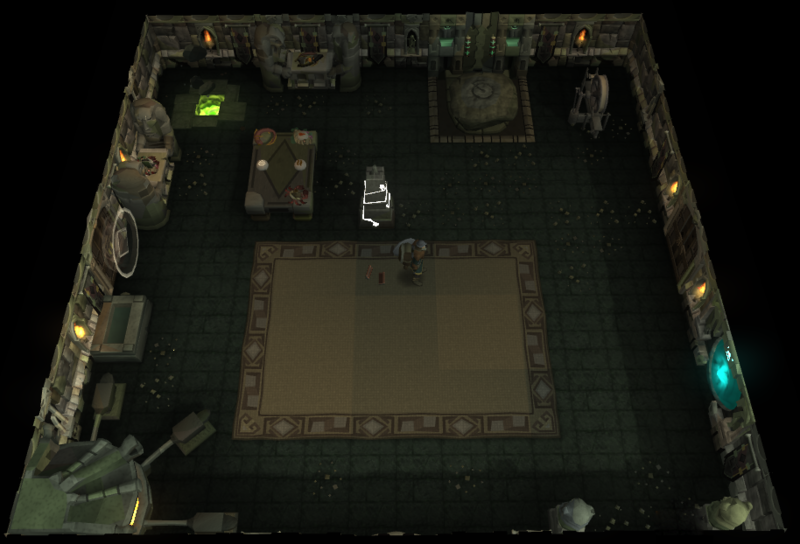 Dungeoneering is a skill in RuneScape which involves exploring the vast dungeons of Daemonheim, while using your other skills to solve puzzles, and battling the creatures that await you. Dungeoneering can only be trained inside the halls of Daemonheim, which is a large peninsula located on the east side of the wilderness. The area inside is not counted as a wilderness area and as such you won't encounter any revenants or player killers. 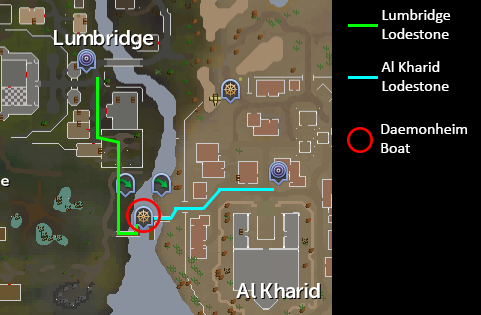 However, the easiest way to get there is to head towards Al Kharid and accept a boat ride from the Fremennik who sits at the dock to the west of the Al Kharid bank. This will take you directly to the east side of the Daemonheim and from here on just go up the stairs and follow the path until you reach a castle surrounded by ice and snow. When you have spoken to the tutor and received the Ring of Kinship you will be able to teleport directly to Daemonheim and there will be no more need for you to go by boat or head through the dangerous wilderness. The Ring of Kinship is a nifty little item that you can pick up from the tutor that is standing outside of the castle area. After talking to him he will give you the Ring of Kinship, this ring is what will allow you to access the dungeons located below Daemonheim and will allow you to train your Dungeoneering. By right clicking on it while it is in your inventory you will find that you have several options to choose from, some of which are available when you right click on it while wearing it. 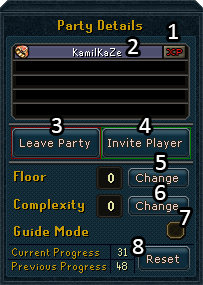 Open party interface: This will open up the party interface and allow you to form a party and adjust settings. Wear: This will equip the ring to give you a free inventory slot. The ring itself gives you no equip bonuses. Teleport to Daemonheim: This teleport will take you right next to the rewards trader and just a jog away from the castle. It cannot be used inside dungeons though. 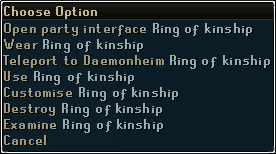 Customise: This allows you to customize your Ring of Kinship to grant you bonuses in a certain class while being worn in Daemonheim. These classes include: Melee, Ranged, Magic, and Skiller. 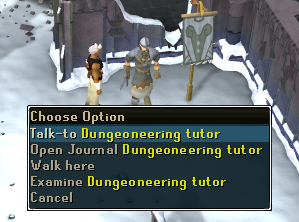 To get started with Dungeoneering right away you should choose to open the party interface from clicking Ring of Kinship. Shared XP: Toggling this give you a share of any gained XP within a dungeon by other party members, if you have the necessary skill level to gain that XP, and regardless of whether your teammates have shared XP toggled on. Player: Right-clicking a player's name will give you a number of choices; Inspect, which will allow you to check out that person's levels and equipment; Kick, which will allow you to kick that person from the party; and Promote, which will allow you to promote that person within the party and making them party leader if you wish. Leave Party: Leaves the current party. If you click this within a dungeon, you will also leave the dungeon. Invite Player: Type in a player's name and it will send them an invite, provided they are in Daemonheim. Alternatively, right-clicking a player will show an 'Invite' option. Floor: This option will allow you to select which floor you will be raiding. Complexity: This option will allow you to select the complexity of the floor, ranging from Complexity 1 to Complexity 6. Guide Mode: Toggling this on will highlight the critical path within a dungeon, however you will be penalized for it. Progress: This shows your current and previous progress, and will allow you to reset your progress (unticking all floors). It is recommended to reset your progress only when you have completed every floor available to you. Note: A dungeon may be started with any amount of players in the team, between one and five. You are also able to join other parties. To do so, another player has to send you an invite afterwhich you will receive a message in your chatbox. Click this message, and a screen detailing the player(s), floor, and complexity will pop up where you can either accept or reject the invitation. Creating/Joining a party isn't necessary to start a dungeon; alternatively you can enter the autogrouping portals in the castle and you will be randomly paired up with others in the area. The floor, complexity, difficulty and dungeon size are determined by the player with the lowest level in your Dungeoneering party and on how many people you were grouped with. Each portal has a specific themed-floor and you can only enter these portals if you have the required Dungeoneering level. Note: You are not allowed to take anything with you inside the dungeon except for the Ring of Kinship, the Orb of Oculus, and specific Daemonheim aura's. If you have extra items on you, there is a banker right outside the castle. You are also not allowed to take any familiars or followers. There are many floors to be explored lying below the castle. 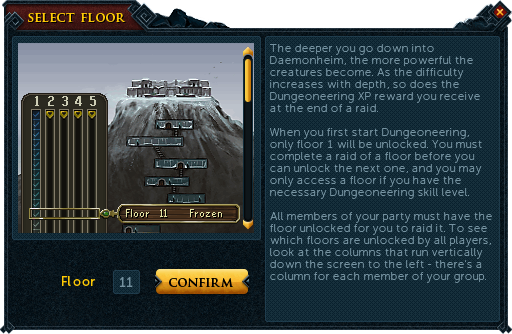 The number of floors you can access is dependent on your Dungeoneering level and whether you have already cleared the floors preceding it. For example, even if you have level 19 Dungeoneering you will not be able to access Floor 10 if you haven't cleared Floor 9 at least once. When you reset your progress, however, this won't be affected and you will be able to access any floor you have accessed before. On this screen the floors that you have already completed will be ticked off. You can still complete these floors if you wish, however they will not count towards your progression. In the event that you reset your progress, then the floors previously ticked off will become coloured squares and completing them again will count towards your current progress. The end of the list of floors which you can access is marked off by a yellow, arrow shaped marker. You can select a floor by hovering your mouse over it, selecting it and then confirming your choice at the bottom. A standard door from each theme, from left to right: Frozen, Abandoned 1, Furnished, Abandoned 2, Occult, Warped. Each theme brings about its own special bosses and monsters too. Take note that bosses will only appear if you have the required Dungeoneering level. This will be elaborated on further into the guide, or click HERE. Free players can access all floors up to Abandoned 2, provided they have the corresponding Dungeoneering level. The complexity you choose determines how tough the floor will be. The higher the complexity means you will need to utilize more skills to complete a floor to its fullest. Also the complexity chosen will affect the Smuggler's shop stock and the facilities available within the starting room. The complexity you choose will also determine the experience you get at the end of each dungeon. If you use a complexity that is lower than 6 you will be penalized for it, starting at a 50% XP penalty for complexity 1. Just like unlocking new floors, you must first progress through each complexity level before unlocking the next. Before entering a dungeon you are able to select a floor difficulty through how many players are in your party, and the size of the dungeon. Difficulty represents the number of teammates that are required in order to complete the critical path of the dungeon and reach the boss. For example, in a floor with difficulty 5:3, there are 5 players in the team but the dungeon can be completed if 2 of them leave the team. Selecting a floor difficulty that is on par with the amount of players in your party will net you a small experience boost, whilst selecting a lower difficulty will penalize you. The higher the difficulty you select, the stronger the monsters will be. In Hard Mode, Medium floors are forced for team sizes of 1 to 2, and Large floors are forced for teams of 3 to 5. The Smuggler's room acts as the hub of a dungeon; you will always spawn inside this room at the start of a dungeon, and should you die you will respawn here. Depending on your complexity, his shop stock will contain many useful items and you will find various facilities to use. Before you go rushing around opening doors, take the time to check out the starting room. There may be a key spawned inside the room already, usually next to or under the Smuggler, so pick it up immediately. Next, go to the supply table and look through it, taking food and equipment you need (be sure to leave some for your team members!). Purchase any supplies you need from the Smuggler and use the facilities provided to create items. If you are on complexity 6, you will find the following equipment to use: a Runecrafting altar, a furnace, an anvil, a water supply, a spinning wheel, a Summoning obelisk, a gatestone portal and a Divination energy rift. There is also a ladder in the corner of the room which you can use to leave the dungeon if you wish. Since it is impossible to bring items into a dungeon, binding items is a vital part of the skill. For dungeons of complexity 3 and lower, the Smuggler will provide you with assistance, in the form of basic armor and weaponry. This will ensure that you are still sufficiently equipped to deal with any threats, as you are unable to smith your own armour and weapons at this complexity. However, for complexity 4 and above, the Smuggler no longer provides such assistance. Your greatest help will come in the form of binds, courtesy of the Smuggler once again. When you bind equipment to you it gets destroyed in the process, however it will enter a bind pool managed by the Smuggler. 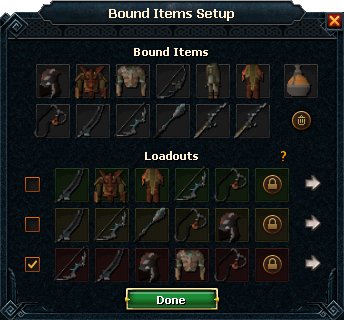 Bound items ensure that you will be instantly equipped with your necessary items at the start of each dungeon. Now the Smuggler is a nice guy and all even if he looks a bit shady, but he isn't your only asset. Inside the dungeon there are many things that can make your life easier. 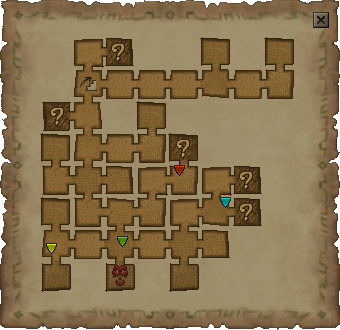 Map: Most notably, the Runescape game map is replaced with a map specifically for your dungeon. This map will show you where all your party members are, all your unlocked rooms, and any locked doors. There is also an icon that denotes the boss, the red scary face; and Smuggler, the stairwell. Hover over a specific triangle to know who that person is. Inspecting players: You are also able to 'Inspect' other players. Open the Party Interface and right-click a player and select 'Inspect'. This will show you their inventory, equipment, and levels. Chat system: Typing a message in public chat will show that message to everyone else, so there is no need to join a friend's chat or privately message others - just shout it! Toolbelt: Just like on the surface world, there is a toolbelt available for use specifically within Daemonheim. Every player will be kitted out with a knife, hammer, chisel, fly fishing rod, needle and tinderbox. On top of that, there is also a novite hatchet and pickaxe provided, however these can be replaced with upgraded variants by choosing the 'Add to toolbelt' option on the item. What is truly unique about this system however is that these tools work as if they are the highest tiered item you can use. 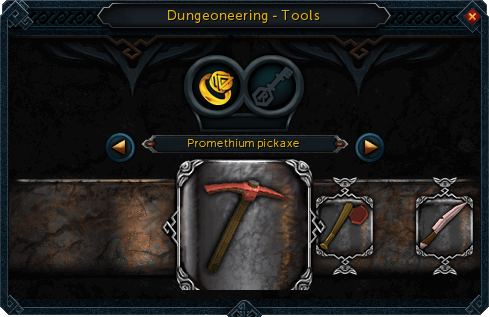 For example, if you have a Primal pickaxe in your toolbelt yet you are only 90 Mining, the pickaxe will act like it is tier-10. When you reach 99 Mining, it will act like a tier-11 tool. With this in mind, it is recommended to add the highest tiered tools to your toolbelt regardless of your levels. Marking: The host can right-click a monster and select “Mark” in order to place a flashing arrow above the target monster, which will also show up on the minimap. This is helpful for hosts to point out monsters for players to focus their attention to, or to direct players to head in the desired direction. Teleporting: Considering how big large dungeons can be, teleporting is an extremely useful tool in traversing the place. The standard teleporting spell book has been replaced with a specialized Dungeoneering spell book for various teleports. Dungeon Home Teleport: Just like the home teleport spell on the surface, this will freely teleport you back to the Smuggler after 10 uninterrupted seconds. Create Gatestone: Requires 32 Magic and 3 Cosmic Runes - This will create a personal gatestone that you can set down and teleport to at any time. Gatestone Teleport: Requires 32 Magic - This will teleport you to your personal gatestone, destroying the gatestone in the process. Group Gatestone Teleport: Requires 64 Magic and 3 Law Runes - This will teleport you to the group gatestone, or if the group gatestone hasn't been placed down then you will be teleported to the party leader. Create Gatestone 2: Requires 90 Magic and Daemonheim Aura 4 (received from completing the Daemonheim Elite Tasks) - This will create a second personal gatestone, differing to the first by its red colour. Gatestone 2 Teleport: Requires 90 Magic and Daemonheim Aura 4 - This will teleport you to your second personal gatestone, destroying it in the process. Despite doors being normally easy to open (simply turning a handle), in these dungeons you will be faced with seemingly-impossible to unlock passages. Have no fear however, as this guide is comprehensive in nature and should provide you with the know-how to tackle these obstacles! There are many different types of doors found inside a dungeon. They can be grouped into four types of categories: unlockable doors, skill doors, puzzle rooms, and combat challenge rooms. Colours: Silver, gold, yellow, orange, crimson, purple, blue, and green. Shapes: Corner, triangle, shield, rectangle, pentagon, and diamond. The list of keys your team has retrieved can be found in the top-left corner of your screen. Remember, as long as there is an unlockable key door in the dungeon, there must be a corresponding key somewhere. 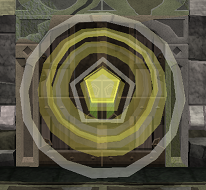 Skill doors, as the name implies, require you to complete a quick task on a door before being able to open them. What this task entails is dependent on the skill, and you must have the necessary level in that skill before being able to complete it. With the exception of Guardian Doors, all skill doors are able to be failed and can result in taking a large amount of damage, usually around 2,000 LP. Take note that items in your toolbelt WILL work. Combat challenge rooms might be deceiving at first. Since these rooms usually contain only guardian doors, you might mistake them for a regular guardian room. However, the monsters you face require you to employ certain tactics in order to kill them effectively. Puzzle rooms require you to complete a certain task before being able to progress through. They require a certain level in a skill (or several skills), and may be challenging to complete. At the end of each dungeon you will have to defeat a boss. Which boss you receive is dependant on your Dungeoneering level, what floor theme you are on, and whether or not the host chose a certain boss using the Daemonheim Aura. As you progress through the themes the bosses up the ante and get harder, so don't think those first few bosses you dispatched easily are representative of the challenge ahead. At the completion of each dungeon, after killing the boss, you will be presented with an experience screen that evaluates your performance and calculates your experience earned through a number of factors. The following image is an example of the experience screen you will be shown. The evaluation can be divided into three categories. Floor XP: This is based on how many rooms you opened, and what level floor you completed. The higher the floor, the more XP you will receive. Prestige XP: You will only receive this bonus if you have not ticked off [completed] the floor yet since you have started or reset. Completing an already ticked off floor will earn you 0 XP in this section. The amount of rooms opened, and amount of rooms cleared will also have an effect on this. Average XP: The calculated average between your floor XP and your prestige XP. This value is what will be modified at the end. Dungeon Size: Based on the selection at the start of the dungeon. Only medium and large sizes give a bonus modifier. Bonus Rooms: Based on how many extra rooms - not relevant to the critical path - you opened. Opening all rooms will give a 13% bonus. 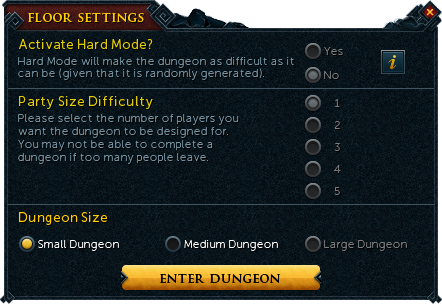 Difficult: Based on the difficulty setting chosen at the start of the dungeon, and amount of players. 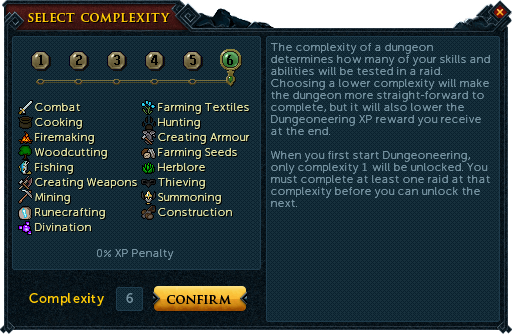 Complexity: Based on the complexity chosen at the start of the dungeon. It is impossible to get bonus XP in this modifier, and you may even get a negative multiplier. Level Mod: Based on amount of monsters killed in each room. Guide Mode: Turning guide mode 'on' will give you a negative multiplier, else this will be 0. Deaths: Based on how many times you die in the dungeon. Anything more than 0 deaths will give you a negative multiplier. Total Modifier: This starts at 100%, and will then factor in the previous modifiers to change the percentage, either above or below 100%. The final value is then multiplied with the average XP. Total XP: This is your Average XP multiplied by your Total Modifier, and is how much XP you will receive for the floor. Tokens: This is 10% of your Total XP and rounded downwards, and is how many tokens you will receive for the floor. Prestige is part of the calculation of experience at the end of each floor. You get a prestige bonus each time you clear a floor that hasn't been ticked off, however many people aren't aware of the fact that you can reset the floors you have done. It will then save your progress as 'Previous Progress' and will give you a bonus based on the previous progress all the way from floor 1 to the floor you were on previously. A helpful reminder - if you reset your progress without redoing all of the floors you previously cleared, your 'Previous Progress' will be set to the amount of floors you had cleared before and your prestige bonus will drop by a lot. If you do this you will lose out on a lot of experience and it will slow down your training significantly, so only reset when you have completed ALL available floors. Hoardstalker ring 10K - Recharge a depleted Hoardstalker ring in your inventory. Bonecrusher 34K 21 Dungeoneering, 21 Prayer Will automatically bury most types of bones dropped by a monster, as long as it is in your inventory. Prayer XP received is the same as if you would normally bury it. Herbicide 34K 21 Dungeoneering, 21 Herblore Will automatically burn herbs dropped by a monster, as long as it is in your inventory. Herblore XP received is double what you would get if you were to clean the herb manually. You can customize which herbs to burn. Charming imp 100K 21 Dungeoneering, 21 Summoning Will automatically collect charms dropped by monsters, as long as it is in your inventory. If you don't want to collect a certain charm type (e.g. gold charms) then you can configure the Charming Imp to automatically consume the charm and grant you Summoning XP for it instead. Gem bag^ 2K 25 Dungeoneering, 25 Crafting (UPGRADE: 40 Dungeoneering) Can store up to 100 uncut gems of the following type: sapphire, emerald, ruby, and diamond. UPGRADE: Will upgrade your gem bag in your inventory, allowing the storage of 60 uncut gems each, now including uncut. Shieldbow sight^ 10K 45 Dungeoneering, 45 Ranged Attach to a maple, magic, or elder shieldbow to increase its abilities. Tome of frost^ 43K 48 Dungeoneering, 48 Magic When equipped, will supply you with infinite water runes. It also reduces damage taken in the desert. Arcane pulse^ 6.5K 30 Dungeoneering, 30 Magic Provides a +13 mage bonus. Farsight quick shot^ 6.5K 30 Dungeoneering, 30 Ranged Provides a +13 ranged bonus. Brawler's jab^ 6.5K 30 Dungeoneering, 30 Attack Provides a +13 melee bonus. Arcane blast^ 15.5K 50 Dungeoneering, 50 Magic Provides a +24 mage bonus. Farsight snap shot^ 15.5K 50 Dungeoneering, 50 Ranged Provides a +24 ranged bonus. Brawler's hook^ 15.5K 50 Dungeoneering, 50 Attack Provides a +24 melee bonus. Arcane stream 100K 70 Dungeoneering, 80 Magic Provides a +44 magic bonus. Made by attaching a Chaotic remnant to a Saradomin's hiss. Farsight sniper 100K 70 Dungeoneering, 80 Ranged Provides a +44 ranged bonus, Made by attaching a Chaotic remnant to a Saradomin's murmur. 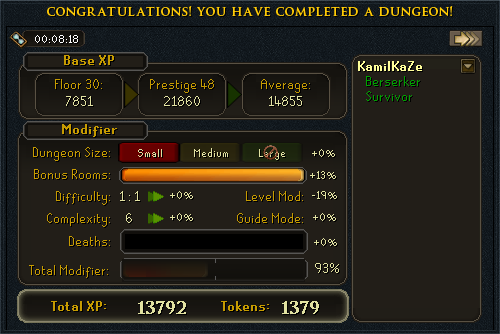 Brawler's knockout 100K 70 Dungeoneering, 80 Attack Provides a +44 strength bonus. Made by attaching a Chaotic remnant to a Saradomin's whisper. Twisted bird skull^ 8.5K 30 Dungeoneering, 30 Prayer Provides a +3 prayer bonus. Restores 50 prayer points for each normal bone buried. Split dragontooth 17K 60 Dungeoneering, 60 Prayer Provides a +4 prayer bonus. Restores 50 prayer points for burying normal bones; 100 prayer points per big, baby dragon, or wyvern bones. Demon horn 35K 90 Dungeoneering, 90 Prayer Provides a +5 prayer bonus. Restores 50 prayer points for burying normal bones; 100 prayer points per big, baby dragon, wyvern bones; 150 prayer points per dragon, ourg, frostdragon bones. Amulet of zealots^ 40K 48 Dungeoneering, 48 Prayer Improves the effect of any single-stat boosting prayer whilst penalizing 5 prayer points. Spirit cape 45K 50 Dungeoneering, 50 Defence, 50 Summoning Provides an armour value of 80, a +17 bonus to each style, and reduces cost of scroll abilities for combat familiars. Anti-poison totem 44K 60 Dungeoneering, 60 Defence, 70 Herblore Prevents you from getting poisoned. Gold accumulator 20K/40K/60K 60 Dungeoneering Automatically picks up dropped coins from monsters. Will degrade to dust after 1 million coins. 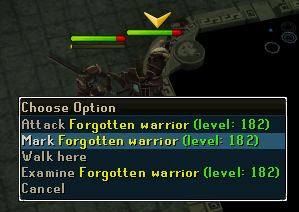 Ring of vigour 50K 62 Dungeoneering, 62 Attack After using an ultimate ability, you will keep 10% adrenaline. Mercenary's gloves 48.5K 73 Dungeoneering, 73 Ranged Provides an armour value of 80, and a lifepoint boost of 219. Law staff^ 10K 45 Dungeoneering, 45 Magic, 40 Attack Can store up to 1000 law runes, and has a 10% chance of saving a law rune per cast. Nature staff^ 12.5K 53 Dungeoneering, 53 Magic, 40 Attack Can store up to 1000 nature runes, and has a 10% chance of saving a nature rune per cast. Chaotic remnant 100K - Can be attached to a Saradomin's murmur/hiss/whisper. Chaotic rapier* 200K 80 Dungeoneering, 80 Attack 1924 accuracy, 980 damage. Off-hand chaotic rapier* 100K 80 Dungeoneering, 80 Attack 1924 accuracy, 490 damage. Chaotic longsword* 200K 80 Dungeoneering, 80 Attack 1924 accuracy, 980 damage. Off-hand chaotic longsword* 100K 80 Dungeoneering, 80 Attack 1924 accuracy, 490 damage. Chaotic claws* 100K 80 Dungeoneering, 80 Attack 1924 accuracy, 768 damage. Made by combining 5 Chaotic spikes together. Off-hand chaotic claws* 100K 80 Dungeoneering, 80 Attack 1924 accuracy, 384 damage. Made by combining 5 Chaotic spikes together. Chaotic maul* 200K 80 Dungeoneering, 80 Attack 1924 accuracy, 1788 damage. Chaotic spear* 200K 80 Dungeoneering, 80 Attack 1924 accuracy, 1788 damage. Made by combining 10 Chaotic spikes together. Chaotic staff* 200K 80 Dungeoneering, 80 Magic 1924 accuracy, damage dependent on spell. Chaotic crossbow* 200K 80 Dungeoneering, 80 Ranged 1924 accuracy, damage dependent on ammunition. Off-hand chaotic crossbow* 100K 80 Dungeoneering, 80 Ranged 1924 accuracy, damage dependent on ammunition. Chaotic kiteshield* 200K 80 Dungeoneering, 80 Defence 384 amour, 385 lifepoint bonus; melee style. Farseer kiteshield* 200K 80 Dungeoneering, 80 Defence 384 armour, 385 lifepoint bonus; mage style. Eagle-eye kiteshield* 200K 80 Dungeoneering, 80 Defence 384 armour, 385 lifepoint bonus; ranged style. Gravite rapier*^ 40K 45 Dungeoneering, 55 Attack 983 accuracy, 673 damage. Gravite longsword*^ 40K 45 Dungeoneering, 55 Attack 983 accuracy, 673 damage. Gravite 2H sword*^ 40K 45 Dungeoneering, 55 Attack 983 accuracy, 1229 damage. Gravite staff*^ 40K 45 Dungeoneering, 55 Magic 983 accuracy, damage dependent on spell. Gravite shortbow*^ 40K 45 Dungeoneering, 55 Ranged 983 accuracy, damage dependent on ammunition. Sneakerpeeper spawn 85K 80 Dungeoneering, 80 Summoning Mini pet version of a Stalker. Frosty 250K 85 Dungeoneering, 99 Summoning; Entered Frost Dragon dungeon Mini pet version of a Frost Dragon. Mini-blink 500K 95 Dungeoneering; Defeated Blink Mini pet version of the boss Blink. Hope nibbler 1000K 101 Dungeoneering; Defeated Hope Devourer Mini pet version of the boss Hope Devourer. Scroll of life 10K 25 Dungeoneering, 25 Farming When harvesting patches (including dead ones), there is a 10% chance of receiving a seed back, and a 5% chance of receiving a tree seed from a dead tree or stump. Scroll of efficiency^ 20K 55 Dungeoneering, 55 Smithing When smithing an item that requires three or more bars, there is a chance of retaining one bar - 50% for bronze, 25% for iron, 20% for steel, 10% for mithril, 8% for adamant, and 5% for rune items. Scroll of proficiency 20K 60 Dungeoneering, 60 Construction When constructing a piece of furniture that requires three or more planks, there is a chance of retaining one plank - 50% for normal, 25% for oak, 20% for teak, 10% for mahogany, and 5% for protean planks. Scroll of dexterity^ 20K 60 Dungeoneering, 60 Crafting When crafting an item that requires three or more of the same ingredient, there is a chance of retaining one of those ingredients. Scroll of renewal 38K 65 Dungeoneering, 65 Prayer A prayer that will restore life points 5 times faster than normal. Scroll of daemonheim 30K 70 Dungeoneering Performing any skilling action in a dungeon has a 50% chance of giving an additional 5% of that XP towards Dungeoneering. Scroll of cleansing 20K 49 Dungeoneering, 49 Herblore When concocting a potion, there is a chance you will complete the potion slightly quicker and will also save the secondary item. * Item will last 10 hours of combat before needing to be recharged. ^ Item can be used on free-to-play servers. To repair an item, simply use the item on the Rewards Trader. You will then be given two options in regards to repairing: solely use money to repair the item, or pay 10% of that value in coins along with 10% of THAT value in tokens. For example, if the repair cost is 880,000gp you can opt to pay with 88,000gp plus 8,800 tokens. Resource dungeons are found scattered across the surface of Gielinor, and contain various monsters for you to kill. Unlike Daemonheim, a party isn't required to access these dungeons and you are able to take whichever items you please. A certain Dungeoneering level is needed to access each resource dungeon, and upon entering a dungeon for the very first time you will be awarded with some Dungeoneering XP. As with every other skill, achieving 99 Dungeoneering will earn you the Dungeoneering Cape of Accomplishment, or Dungeoneering skillcape. However, Dungeoneering is the first skill that progresses past the level 99 mark, all the way up to a daunting level 120 - roughly 104 million XP. 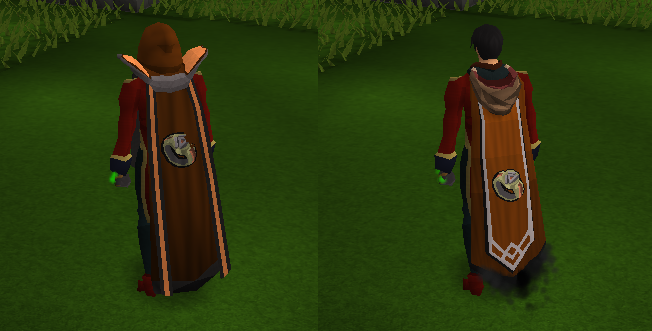 Achieving 120 Dungeoneering will earn you the Dungeoneering master cape, which is a trimmed down version of the cape with black particle effects smoking out the bottom. Sinkholes are a short Dungeoneering Distraction and Diversion (D&D) that can be completed twice daily, rewarding you with Dungeoneering tokens, XP, and numerous outfits. Sinkholes spawn once an hour at the 30 minute mark and will last for approximately 15 minutes before collapsing; five people are required to start a sinkhole raid.